Prompted by my friends over at the Liberal Gun Club, this is another in an occasional series of revisiting some of my old articles which had been published elsewhere over the years, perhaps lightly edited or updated with my current thoughts on the topic discussed. This is an article I wrote for Guns.com, and it originally ran 9/18/2012. Images used are from that original article. Some additional observations at the end. At the risk of seeming to be obsessed with the .460 Rowland cartridge, given that I have written about it three times this year, allow me to give a report on what it is actually like to convert a Generation 3 Glock 21 over to .460 Rowland using a conversion kit from 460Rowland.com. One of my Ballistics By The Inch buddies had a Glock 21 9/11 Commemorative model, and was anxious to try the conversion kit. He ordered it in, got it in good time, and we got together to give it a try. First thing we did was field strip the Glock and check everything over. The gun has been shot, but not a lot. Everything with it looked fine. We went ahead and set up a single chrono, just so we could get some numbers for comparison. This wasn’t the usual more formal BBTI set-up, but we figured it would suffice. Using the original .45 ACP hardware in the Glock, we shot some standard 230-grain ball ammo. It gave us readings in the expected range: about 780 fps. Then we ran some premium self-defense ammo, Cor-Bon 230 grain +P JHPs, and again got performance in the range expected: about 980 fps. Satisfied that the Glock was performing normally, we turned to the conversion kit. The current kit shown on the site now also has a small packet of what looks like blue loc-tite and runs for $319 (now $387, more for a Gen 4). The instructions indicate that you’re supposed to secure the compensator with loc-tite, so my buddy brought some along. This is probably why they now include a small packet of it with the kit. If you’re familiar with Glocks, you know that field-stripping the gun is simplicity itself. We did so, and removed the original spring assembly and barrel. Then we checked to make sure the new parts looked like they would fit. Everything seemed fine in comparison to the original parts. We installed the new barrel, then the new recoil spring assembly. Close examination seemed to indicate everything was where it needed to be. We re-assembled the slide to the frame. Again, everything seemed to be fine. Manually cycling the gun, there was little or no noticeable difference. 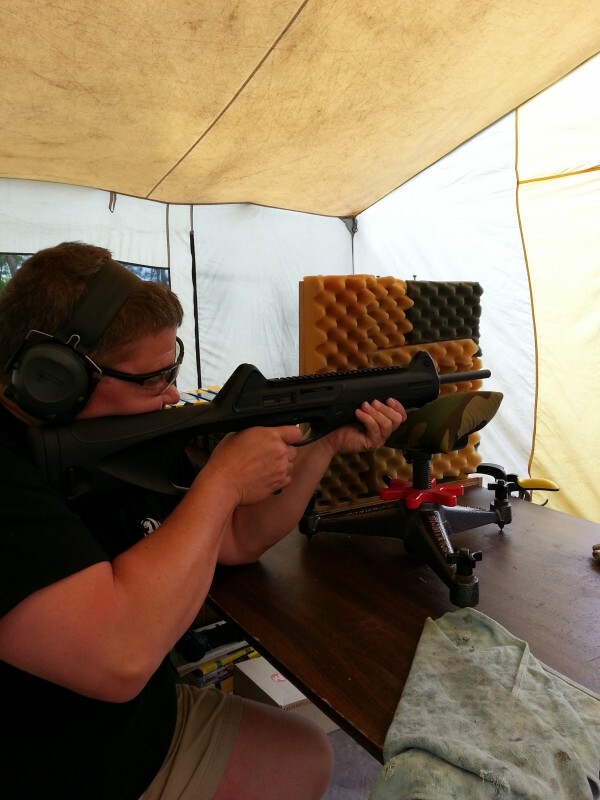 We decided to go ahead and try the gun at that point, before mounting the compensator, just to get a feel for it. This is not recommended, but we wanted to be thorough in our test, as informal as it was. The .460 Rowland ammo we had was the same as we had tested previously for BBTI, and what started me on this kick: Cor-Bon 230 grain ‘Hunter’ JHP. Initial shots were about 1170 fps. Just about what I expected. The recoil was stout, and there was some muzzle flip, but neither was particularly bad. We proceeded to mount the compensator that came with the kit. The compensator just screws onto the threaded portion of the extended barrel. You screw it down until it is almost to the front of the slide, with the compensation holes facing straight up. Then back it off a couple of turns, add some loc-tite, and reposition the compensator. Allow it to dry sufficiently. Once it was ready (not completely cured, but sufficient for our needs), we loaded the gun again and ran it through its paces. And we gained about 50 fps. Yeah, all the subsequent chronograph readings were 1220 to 1230. Nice. Also nice was the way the compensator changed the character of the recoil: it was still stout, but there was significantly less muzzle flip. We all shot the gun through at least a full magazine (13 rounds) and agreed – it was faster and easier to re-acquire your target with the compensator, and the gun took less man-handling to control. The recoil was, as noted, still stout, and felt different than the slow push of shooting a .45 ACP out of the Glock. It was probably closer to shooting a 10mm. The 460Rowland.com site touts a Nosler 185 grain JHP “carry ammo” and claims that it achieves 1550 fps. I haven’t tested it, but I’d believe it. And if so, you’re talking a whopping 987 foot-pounds of energy out of the thing. That puts it beyond the 10mm. Beyond the .41 Magnum. That puts you pretty solidly into .44 Magnum territory. Even the 230 grain round we tested has a respectable 766 foot-pounds of energy – compared to 526 for the same weight bullet out of a .45 ACP +P. I said it before and I’ll repeat it here: if you carry a .45, you should instead be carrying a .460 Rowland. Time for a serving of Crow: I now seldom recommend that people make the full switch to .460 Rowland. As I have previously noted, I have now changed over to using the .45 Super cartridge rather than the .460 Rowland because the .45 Super offers most of the benefits of the .460 Rowland without some of the disadvantages. But I have kept the conversion kit in place because it gives me more flexibility in ammo selection and more control of the gun. And since I don’t carry the G21, the extra mass/length of the compensator doesn’t make a difference in day-to-day use. “Disadvantages” to the .460 Rowland? Well, I could never get my G21 to stop chewing up mags when shooting full-power .460 Rowland out of it. And the recoil could be … daunting, even for me (I’m not particularly recoil sensitive). I couldn’t ever share ammo with someone who had ‘just’ a .45 (the .460 case is slightly longer, and won’t chamber) — which is good (and intentional), because a lot of guns can’t handle the extra power of the .460 Rowland. Now, the .460 Rowland definitely IS more powerful than the .45 Super out of handgun-length barrels. By a couple hundred foot-pounds of Muzzle Energy. That’s about the power difference of the .45 Super over the .45 ACP +P. But the .45 Super beats pretty much every other common handgun cartridge except the .460 Rowland and .44 Magnum. You have to decide for yourself what trade-offs to make. But do so in an informed way. Look at the numbers. Try guns set up to shoot the different cartridges if at all possible — I often will stage my G21 to shoot three rounds each of .45 ACP, then .45 Super, then .460 Rowland so people can try the three rounds head-to-head. And usually they decide that .45 Super is more than sufficient. Prompted by my friends over at the Liberal Gun Club, this is another in an occasional series of revisiting some of my old articles which had been published elsewhere over the years, perhaps lightly edited or updated with my current thoughts on the topic discussed. This is an article I wrote for Guns.com, and it originally ran 2/15/2012. Images used are from that original article. Some additional observations at the end. “It’s a toy!” Is what I am tempted to say about the Kel Tec Sub-2000. It is small. It is light. It is mostly plastic. And it folds in half. It’s a toy—except it isn’t. No real firearm is, so it’s most definitely NOT a toy. But it is as much fun as about any toy I remember from my childhood. But it is not what you’d call a “high-end” firearm. The fit and finish are only OK. It wins no points on attractiveness. Accuracy is acceptable, but not much more. It has some operating quirks you have to watch out for. It is prone to annoying (but easy to correct) jams. But I love this little carbine. Have since I first got one, in 9mm, several years ago. There are a lot of decent reasons to have a pistol caliber carbine. You can find my article discussing them here but briefly they are: about 15 percent increased power out of the same ammunition*, much better sight radius for increased accuracy, reduced recoil and good ergonomics, and handling the same ammo as your pistol. With the Sub-2000 you get all of these, plus a gun that seems to be well made for a decent price and that folds in half. Yeah, that’s right: you pull on the trigger guard, and the barrel hinges upwards. It closes on itself, locks in place, and you have a carbine that’ll fit into a pizza box or a laptop bag. When you want to use it, just release the locking mechanism, unfold it, and it snaps solidly back into being a carbine. That’s just cool. And while the Sub-2000 isn’t a gun made for target shooting, it’ll stay in the black at 50 yards, being shot unsupported. With support, 100 yards isn’t too much for it, either. This is with the standard simple peep sights (front sight is adjustable). You’re not talking MOA accuracy, but you can easy pop tin cans out to 50 yards when you’re just wanting to have fun. Operation is easy, and dis-assembly a cinch for cleaning. What’s not to like? Well, it’s a simple blow-back mechanism, and the charging/operating handle is on the bottom of the stock where it can snag clothing. The bolt does not lock back on an empty magazine. Mine does sometimes jam, usually a “failure to eject” spent cases completely, sometimes a “failure to feed” new cartridges. Yet, it’s usually easy to clear such jams with a cycle of the operating handle, but you do have to take a moment to do it. The Sub-2000 is so short that I added on a stock extension, but it still feels a bit cramped for my long arms. And it can be a bit tough when wearing hearing muffs to get down behind the rear sight well enough to get a good sight picture. This is not a gun that will impress your friends with its craftsmanship and fine detail. But it is decently made, and works. A buddy of mine who was the armorer for his PD SWAT team liked shooting mine so much, he got one for himself, and loves it – and this is a guy used to handling and shooting the best of the sub-guns available. I think that says a lot right there. I love it, even though it’s a bit of a mongrel – not entirely one thing or another. The quality could be a bit better. But I love it. I’d buy another in an instant. Since I wrote that, Kel Tec has come out with a “Gen 2” model which has gotten pretty good reviews. The changes seem to be mostly a better sight (which wouldn’t be hard) and more ways to mount accessories. I haven’t tried one yet, but I wouldn’t have any qualms about buying one if a deal came my way. I continue to really enjoy this little gun, and still everyone who tries it thinks it’s entirely too much fun. And the fact that I can transport it (and additional mags) in a standard business briefcase seldom fails to amuse people at the range. Now about the * concerning ammunition performance: the 15% increase in performance is typical for 9mm or .40 S&W, the two cartridges for which the Sub2000 is chambered. It also applies to .357 Sig, 10mm and .45 acp — other fairly common pistol caliber carbines. But it doesn’t apply to any of the ‘magnums’: .327, .357, .41, or .44. And as I’ve noted previously, it doesn’t apply to the .45 Super cartridges, which behave much more like a true magnum. Reprise: Beretta CX4 Storm .45 ACP/Super review. Prompted by my friends over at the Liberal Gun Club, this is another in an occasional series of revisiting some of my old articles which had been published elsewhere over the years, perhaps lightly edited or updated with my current thoughts on the topic discussed. This is an article I wrote for Guns.com, and it originally ran 12/26/2011. Images used are from that original article. Some additional observations at the end. I like pistol-caliber carbines (PCCs). I think that they are a very good solution to a number of problems. However, the toughest thing about a PCC is finding one you can shoot well. In addition to some cowboy action carbines, there are plenty of other options out there – Kel Tec Sub 2000, Kriss Vector, there’s even a few Hi-Points – but the Beretta CX4 Storm is one of the best I’ve shot. Beretta has been around forever, and they have more than a little experience in making firearms for a very wide range of applications. They designed the CX4 (and the MX4 military version) to be lightweight yet reliable for personal defense and sporting purposes. For this use, it is ideal. Right out of the box the CX4 Storm is fairly basic, but offers a huge range of personalization possibilities. It’s easy to adjust the overall length of pull, to accommodate both those who have shorter arms and for apes like me. It has a Picatinny rail on the top for optics, one on the side for whatever, and one on the foregrip, which can be extended out under the barrel. Additional rails can be added at several locations, and you can load this gun down with enough tacticool stuff to make a mall ninja drool. Standard sights include a front post, which is adjustable with a provided tool, and a rear sight with two apertures – a smaller one for long range/accuracy and a larger one for quick target acquisition. Both sights fold down and out of the way if you want to put a different kind of optics on the top rail. One very nice feature is that the gun is designed to be easily converted from right-hand to left-hand use. The magazine release, the safety, the ejection port are all reversible with minimal gunsmithing skills, and most buyers can probably do the change themselves without difficulty. The gun is also very ergonomic – which makes it easy to shoot it well. First time I picked it up I put all eight rounds (I was shooting the .45 ACP model) into a ragged hole less than an inch across at 25 yards. This is one of the main reasons that I like PCCs – the increased stability and sight radius of a carbine, combined with minimal recoil, make them very easy for even a novice to shoot well. The CX4 Storm is light enough (under six pounds) to not be wearying, yet heavy enough to absorb the recoil of .45 ACP rounds without any problem whatsoever. Part of the ergonomic design is the balance of the carbine, which helps it to point naturally as well as allow moving easily with it. As you would expect with a firearm made by Beretta, the quality is top notch. Fit and finish are excellent – there are no rough spots or small gaps, no problems with the magazine seating properly, no difficulty with the charging handle or safety that I experienced, though others have reported some problems getting the safety to engage/disengage in the past. The specs for the gun state that it has a hammer-forged and chrome-lined barrel for long life and easy cleaning. All in all, it feels solid and gives you confidence that it will last for many years. At $915, the MSRP is higher than you’ll pay for many other good quality pistol-caliber carbines, but it is not outrageous and you know you are getting a firearm you can trust (or depend on the manufacturer to stand behind if you have any problem.) And new ones can be found for around $700, as well as good used ones for a significant discount. Bottom line: the Beretta CX4 Storm is a fine gun, which does everything it is designed to do, and there’s a good reason why most owners love them. If you get a chance, give one a try in your favorite caliber. If you haven’t guessed, I still really like it. Glock carving for fun & profit! Look particularly at the backstrap: it’s now almost complete straight. My buddy took off most of the swell towards the bottom of the strap using a rasp and then sandpaper. He has little, meaty hands, and this change allows him to get much better purchase on the gun, with much better trigger position. He’s also planning on increasing the undercut on the trigger guard to accommodate his finger better. Personally, the straight backstrap made it more difficult for me to get a good grip on the gun, and shooting the +P+ ammo out of it was downright painful for me, while the same ammo out of the unaltered G43 was just mildly annoying. The owner of the standard G43 didn’t have a problem with either ammo, and it was clear that my friend with the altered G43 was *much* more comfortable shooting it than the standard version. So if you’ve ever thought about adjusting the grip of a Glock to better suit you, know that there are options out there which might be worth exploring. After those tentative explorations in altering his G43, my friend decided to see what changes he could make to a couple of his other Glocks. Now, before I go any further, some caveats: these changes probably ruin any warranty on the guns; they probably shorten the expected lifespan of the gun; and they may very well increase the chance that the gun would fail in normal use and injure the shooter. And they may give Glock purists reason to faint dead away, just looking at them. So DON’T DO THIS; if you do insist on doing this you do it at YOUR OWN RISK; and DON’T EVEN READ FURTHER if you are a Glock purist with a weak stomach. As I said, my friend has little, meaty hands, and even the small G43 presented a problem for him in gaining a good secure grip. So both his G36 and his G21 presented an even greater challenge. G36 on top, left. G43 on right. G21 on bottom, left. Also note that on each of the guns he had to trim out a bit of the bottom of the mag well on the back, because there was part of the mag well which extended down and would bite into the palm of his hand. You can see this part of the mag well in the very first image above. And it felt like it. I shot each of his guns, at least a full mag each, to see how the altered guns would fit my much larger (and less muscular) hands. Both the G43 and the G36 felt a little cramped in my hand, but were comfortable enough for a single mag of ammo. The much more altered G21 has a fairly sharp ridge where the back of the mag well dug into my palm. My friend also feels this, and is planning on trying to add a slip-grip to deal with it. If that doesn’t work, he can sculpt some PC7 along that edge to soften it. Now, this kind of alteration isn’t something I recommend. It won’t work for everyone, and as noted it has some real downsides. But for my friend, it has finally allowed him to really get a proper fitting Glock in these three different models. It’s made a big difference in his comfort and accuracy shooting, and he is at peace with the possible downsides. So if you have an unusual hand size or shape, it might be something to consider. All you really need is a file/rasp and some sandpaper … and nerves of steel. Reflections upon a reflex sight. I recently came across a really good sale on a Trijicon RMR reflex sight, and decided to take the plunge and add it to my Glock 21. I had handled and shot some other competition handguns with a reflex set-up, but I hadn’t yet tried one on a more-or-less stock gun intended for routine use, and wasn’t sure how well it would work or how I would like it. 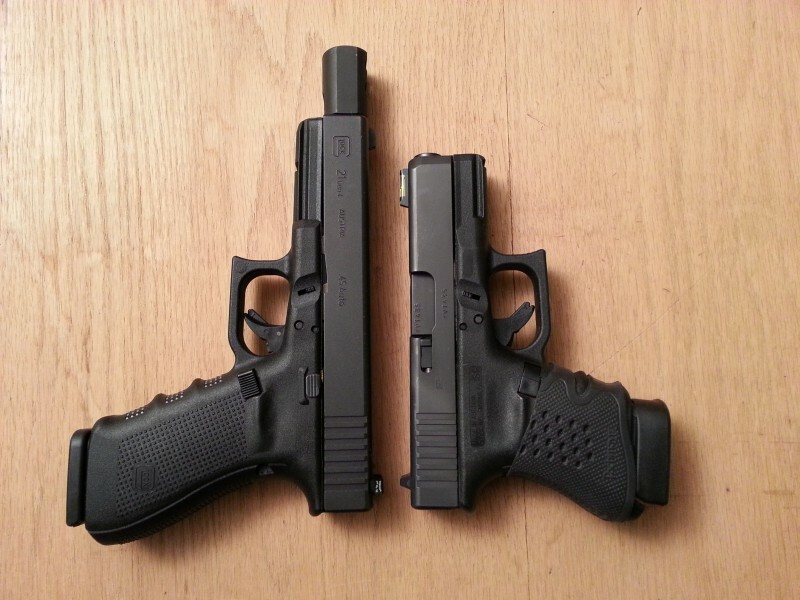 Converted G21 on left, G30S on right. As I have previously noted, I have now changed over to using the .45 Super cartridge rather than the .460 Rowland because the .45 Super offers most of the benefits of the .460 Rowland without some of the disadvantages. But I have kept the conversion kit in place because it gives me more flexibility in ammo selection and more control of the gun. And since I don’t carry the G21, the extra mass/length of the compensator doesn’t make a difference in day-to-day use. Thinking along those lines, I figured that adding a reflex sight to the G21 wouldn’t cause a problem, and might make it an even better home defense firearm. And this morning I had a chance to take it out to the range for testing, to see what I thought of it. I like it. A lot. It took a little getting used to, since I have about 50 years of shooting experience which has conditioned me to always look for the front sight on a gun, and place that on the target. The RMR sticks up too much for that to work well, and if you can see the front sight through the RMR you probably won’t see the red dot. Rather, you have to tilt the front of the gun down for the red dot to appear. This actually puts the gun back to the normal position you shoot it in, but you’re just looking above the front sight — parallel to the slide, as it were. The RMR I got was the one with the 6.5 MOA dot, which I figured would be easier and quicker to get on target even if I wasn’t wearing my glasses, and would give me adequate accuracy at any distance I was likely to use the gun (say 25 yards or less). At 10 yards distance at the range, the dot appeared to be about half-an-inch across, perhaps a bit more. For my purposes this was more than accurate enough to knock down steel plates consistently. As I get more used to the RMR, moving out to 25 yards should give similar results. Now that I’ve tried it on this gun, I can understand why others have decided to have a mount for the RMR milled into the slide of their gun. That would bring down the location of the dot and make everything more consistent with previous shooting experience. It would also make the gun more compact and more suitable for either duty or concealed carry. I doubt that I will go to the trouble or expense to have this done on the G21, but it is something I would consider for the G30S shown above, particularly if the next generation of reflex sights are even more compact and suitable for a handgun. It’s something to think about, anyway. Prompted by my friends over at the Liberal Gun Club, this is another in an occasional series of revisiting some of my old articles which had been published elsewhere over the years, perhaps lightly edited or updated with my current thoughts on the topic discussed. This is an article I wrote for Guns.com, and it originally ran 3/26/2011. Some additional observations at the end. In an earlier article, when I said you’d get about a 15% increase in bullet velocity when using a pistol caliber carbine over a handgun, I lied. Or, rather, I was neglecting one particular class of pistol ammunition which can develop upwards of a 50% increase in velocity/power in a carbine over a handgun: the “magnums,” usually shot out of a lever-action gun. This would include .327 Federal Magnum, .357 Magnum, .41 Magnum, and .44 Magnum. These cartridges are rimmed, initially developed as powerful handgun rounds, and have their origins in black powder cartridges. This history is important for understanding why they are different than most of the other pistol cartridges and the carbines that use them. We’ll start with the .357 Magnum, the first of these cartridges developed. Back in the 1930s a number of people, Elmer Keith most notable among them, were looking to improve the ballistic performance of the .38 Special cartridge. This had been a cartridge originally loaded with black powder. Black powder takes up a lot of space – typically two to four times as much space as smokeless powder of a similar power. Meaning that when people started loading .38 Special cartridges with smokeless powder, the cartridge was mostly empty. Now, if you were looking to get more power out of a .38 Special, and you saw all that unused space in the cartridge, what would be the obvious thing to do? Right – add more smokeless powder. The problem is, many of the handguns chambered for the .38 Special using black powder were not strong enough to handle .38 Special cartridges over-charged with smokeless powder. And having handguns blowing up is rough on the customers. Heavier-framed guns could handle the extra power, but how to distinguish between the different power levels and what cartridge was appropriate for which guns? The solution was to come up with a cartridge, which was almost the same as the .38 Special, but would not chamber in the older guns because it was just a little bit longer. This was the .357 Magnum. There are two important aspects of the cartridge as far as it applies to lever guns. One is just simply the ability to use more gunpowder (a typical gunpowder load for a .357 magnum uses about half again as much as used in a .38 Special.) And the other is that you can get more complete combustion of the gunpowder used, perhaps even use a much slower burning gunpowder. This means that the acceleration of the bullet continues for a longer period of time. How much of a difference does this make? Well, from the BBTI data for the .357 Magnum, the Cor Bon 125gr JHP out of a 4″ barrel gives 1,496 fps – and 2,113 fps out of an 18″ barrel. Compare that to the .38 Special Cor Bon 125gr JHP out of a 4″ barrel at 996 fps and 1,190 fps out of an 18″ barrel. That’s a gain of 617 fps for the .357 Magnum and just 194 fps for the .38 Special. Put another way, you get over a 41% improvement with the Magnum and just 19% with the Special using the longer barrel. Similar improvements can be seen with other loads in the .357 Magnum. And with the other magnum cartridges. And when you start getting any of these bullets up in the range of 1,500 – 2,000 fps, you’re hitting rifle cartridge velocity and power. The low end of rifle cartridge velocity and power, but nonetheless still very impressive. There’s another advantage to these pistol caliber lever guns: flexibility. Let’s take that .357 again. On the high end of the power band, you can use it as a reliable deer-hunting gun without concern. But if you put some down-loaded .38 Special rounds in it, you can also use it to hunt rabbit or squirrel. I suppose you could even use snake/rat shot loads, though most folks don’t recommend those loads due to concerns over barrel damage. Shooting mild .38 Special loads makes for a great day just plinking at the range. One thing that I consider a real shame: you can get good quality lever guns for the .357, the .41, and the .44 magnums. But to the best of my knowledge, no one yet makes a .327 Magnum lever gun. I would think that such a gun would meet with a lot of popularity – properly designed, it should be able to handle the .327 Federal Magnum cartridge, the .32 H&R cartridge, even the .32 S&W Long. Again, with the right powder loads, this would give the gun a great deal of flexibility for target shooting and hunting small to medium sized game/varmits. So, if you like the idea of having a carbine in the same cartridge as your handgun, but want to be able to maximize the power available to you, think about a good lever gun. It was a good idea in the 19th century, and one that still makes a lot of sense today. I’m still a little surprised that no manufacturer has come out with a production .327 mag lever gun, though occasionally you hear rumors that this company or that company is going to do so. But I must admit that as time has gone on I’ve grown less interested in the .327 cartridge, since firearms options are so limited — definitely a chicken & egg problem. One very notable absence from the above discussion is the .22 WMR (.22 Magnum), for the simple reason that we hadn’t tested it yet when I wrote the article. You can find a later article about it here. Something I didn’t address when I wrote the article initially was ammunition which was formulated to take greater advantage of the longer barrel of a lever gun. Several manufacturers produce such ammo, perhaps most notably Hornady and Buffalo Bore. A blog post which includes the latter ammo out of my 94 Winchester AE can be found here, with subsequent posts here and here. And lastly, there’s another cartridge we tested which really should be included in the “magnum” category, because it sees the same increasing power levels out to at least 18″ of barrel: .45 Super. This proved to be more than a little surprising, since it is based on the .45 ACP cartridge. Most semi-auto firearms which shoot the .45 ACP should be able to handle a limited amount of .45 Super, but if you want a lever gun set up to handle the cartridge you’ll have to get it from a gunsmith. My friends over at the Liberal Gun Club asked if they could have my BBTI blog entries cross-posted on their site. This is another in an occasional series of revisiting some of my old articles which had been published elsewhere over the years, perhaps lightly edited or updated with my current thoughts on the topic discussed. This is an article I wrote for Guns.com, and it originally ran 3/7/2011. Some additional observations at the end. It’s a question I get a lot, thanks to my involvement in Ballistics By The Inch. And invariably, I say in response: “it depends.” As in, it depends on what you’re going to use it for. OK, first thing: I’m talking about pistol cartridges, not rifle cartridges. Got that? Pistol cartridges. That’s what we studied with our BBTI project (actually, continue to study, since we’ve done several expansions of the cartridges and ammunition tested already, and have another big expansion coming up the beginning of May.) Now that we’ve cleared that up . . . Different barrel lengths are good for different purposes. The longer the barrel, the longer the sight radius, and so the easier it is to be accurate with the gun. The shorter the barrel, the easier it is to conceal. And barrel length has an effect on the velocity of a bullet (and hence the power of that bullet.) How much of an effect? Well, it depends. 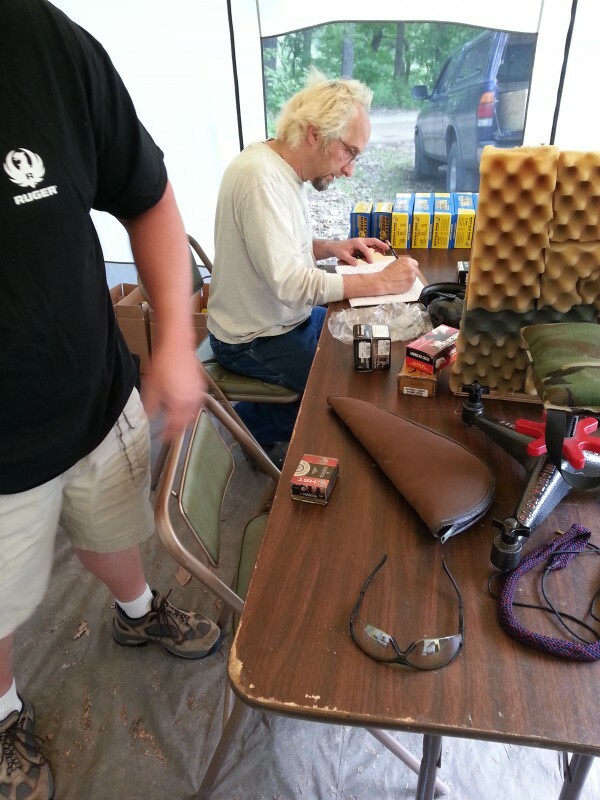 Cor Bon 165gr JHP +P .45 ACP ammo was tested at 1001 fps with a 2″ barrel. That jumps to 1050 fps with a 3″ barrel, or an increase of about 50 fps. Going to a 4″ barrel you get 1163 fps, or an increase of 113 fps. But when you go from an 10″ barrel to a 11″ barrel, you only get an increase of 23 fps. Let’s look at Federal Hydra-Shok 230gr JHP .45 ACP. It starts at 754 fps with a 2″ barrel, and jumps to 787 fps out of a 3″ barrel – an increase of 33 fps. Go to the 4″ barrel and it tested at 865 fps – an increase of 78 fps. And when you go from an 10″ barrel to a 11″ barrel, you only get an increase of 4 fps. Do you see my point? It not only varies by ammunition, it also varies by which inch of the barrel you are talking about – the inch between 3 and 4 sees a lot more increase than the inch between 10 and 11. Some cartridges even show velocity starting to drop off with longer barrels, as the friction of the bullet passing through the barrel overcomes any additional boost from the gunpowder. Notably, the “magnum” cartridges (.327, .357, .41, and .44) all show a continued climb in velocity/power all the way out to 18″ of barrel length (the maximum we test), though the amount of increase tends to get smaller and smaller the longer the barrel. So, back to “it depends”: if you want a lever-gun or carbine, which uses a pistol cartridge, you’re best off using one of the magnums if you want maximum power. If, however, you want to use a carbine for an additional power boost and better aiming, one with a barrel length somewhere in the “plateau” for a given cartridge makes sense (and this is why subguns typically have barrels in the 8 – 10″ range). For a hunting pistol, you probably want to have a barrel of 6″ to 8″ to get a lot of the additional power and still have it manageable. This barrel length will also give you a nice big sight radius for accuracy, making it good for hunting or target shooting. How about for concealed carry? The shorter the barrel, the better, right? Well, if you look through all our data, you’ll see that usually, most cartridges see the greatest jump in velocity (and hence power) from 2″ to 4″. Now, the smaller the caliber and the lighter the bullet, the more the big jump tends to come right up front – from 2″ to 3″. The larger the caliber and the heavier the bullet, the more it tends to come a little later, from 3″ to 4″. Still, you can decide for yourself whether the trade-off in less power for ease of carry is worth it. And good news for the revolver fans: because the cylinder basically functions to extend the barrel, your 2″ snubby actually functions more like a gun with a 3.5″ – 4″ barrel. Though there is some velocity/power loss due to the cylinder gap. How much loss? That is actually the next thing we’ll be testing, but I’d bet that . . . it depends. Since I wrote that six years ago, we’ve done a LOT more testing at BBTI, and have now shot more than 25,000 rounds and greatly expanded our data. The cylinder gap tests mentioned above did indeed show that the amount of loss did vary according to a number of factors, but for the most part established that the effect wasn’t as large as many people thought. And we found an interesting exception to the “magnum” rule in one of our most recent tests: it turns out that the .45 Super cartridge behaves like a true magnum, by continuing to gain more power the longer the barrel, until at carbine lengths it is on a par with (or even exceeds) the .460 Rowland cartridge. Since the .45 Super is based on the .45 ACP cartridge, we expected it to perform like that cartridge and level off at about 10″, but it clearly continues to gain out to at least 18″. I also want to add a couple of quick comments about how concealed-carry guns have changed, though this is more just personal observation than any kind of rigorous research. I think that as concealed-carry has continued to expand, more gear is on the market to make it easier to do, and I think for that reason some people are able to carry slightly larger guns and there are more guns available with barrel length in the 4″ – 5″ range. In addition, sight/optics/laser options have continued to improve, making simple sight radius less of a factor — meaning that for those who do want to carry a smaller gun, it is easier to use it well (though having better sights/optics/lasers is NOT a substitute for practice!) I expect that both these trends will continue. 2016 in the rear-view mirror. A quick recap of the last year: surprisingly active. It’s interesting to see how things have evolved with BBTI over time. The last test sequence we did was the .45 Super /.450 SMC tests, with the data published in October 2015. So without new test results last year, we didn’t have the usual big spike in site visits. But we still saw a total of 447,203 visitors last year, which ain’t too shabby. All but four (Guns.com, MechTech Systems, Wikipedia, and The Firearm Blog) are discussion forums, and of those four The Firearm Blog also has a very active discussion community. MechTech Systems sells conversion kits for pistols, allowing you to turn your pistol into a carbine, so it makes perfect sense that they would link to us showing the advantage you can gain with a longer barrel. In other words, most of the referrers are places where BBTI is being cited as a reference to help people make decisions about their firearm choices. That just makes sense, and corresponds to the email we get, thanking us for our site or asking for clarification/recommending new ammo to test. After 8 years, and with no new tests, there’s not much reason for the ‘news’ sites to mention us — but there’s still plenty of interest in the firearms community in the data we provide. So thanks to all who share our site with others! You’re the real reason our site is a success! I love my Cx4 Storm carbine, as I have mentioned and reviewed. Particularly once it was set-up to deal with the additional power of the .45 Super cartridge, it has proven to be a reliable and formidable home defense gun. But there is ONE thing I don’t like about my Cx4: in .45 ACP/Super, the magazines only hold 8 rounds. Beretta doesn’t offer a larger capacity magazine. Wait — let’s make that TWO things I don’t like about my Cx4: the standard magazine fits up inside the mag well, such that it can be hard to extract and may pinch your hand if you try to do a quick change of mags. Wait again, there’s a THIRD thing: while there’s ample room for it in the composite buttstock, Beretta didn’t see fit to include storage for one or more additional magazines. OK, so here are some solutions I came up with to deal with these problems. The first two problems are fixed by an after-market product which extends the standard mag by two rounds, and is designed such that it fits with the bottom of the mag well and won’t pinch your hand during a fast magazine change: Taylor Freelance Extended Magazine Base Pad. They’re not cheap, but they’re well made and work fine. Since I am right-handed, the mag pouch doesn’t get in my way, and it puts an extra 40 rounds immediately available such that I don’t even need to take the carbine down from my shoulder in order to quickly reload. It’s not perfect, but it’s a good workable solution to the limitations of the Cx4. And now I love my little carbine even more. All along, we’ve said that if someone wanted to take the time, trouble, and expense to do some additional research along the lines of our protocols, that we’d be happy to include their data on our site. This is particularly true if it helped expand the selection of “real world guns” associated with the data for a given caliber/cartridge. Well, for the first time someone has expressed an interest in doing just that, prompting us to come up with an outline of what standards we feel are required for making sure it relates to our previous tests. The biggest problem is that ammo manufacturers may, and do, change the performance of their products from time to time. This is why we have on occasion revisited certain cartridges, doing full formal chop tests in order to check how specific lines of ammo have changed. That gives us a benchmark to compare other ammo after a period of several years have passed, and shows how new tests relate to the old data. But without going to such an extent, how can we be reasonably sure that new data collected by others using their own firearms is useful in comparison to our published data? Full description and images of the test platform (firearm) used in the tests. This must specify the make, model number, barrel length, and condition of the firearm. Ideally, it will also include the age of the firearm. That a good commercial chronograph be used. Brand isn’t critical — there seems to be sufficient consistency between different models that this isn’t a concern. However, the brand and model should be noted. Chronographs must be positioned approximately 15 feet in front of the muzzle of the firearm used to test the ammo. This is what we started with in our tests, and have maintained as our standard through all the tests. That five or six data points be collected for each type of ammo tested. This can be done the way we did it, shooting three shots through two different chronographs, or by shooting six shots through one chronograph. All data must be documented with images of the raw data sheets. Feel free to use the same template we used in our tests, or come up with your own. Images of each actual box of ammo used in the test must be provided, which show the brand, caliber/cartridge, and bullet weight. Also including manufacturer’s lot number would be preferred, but isn’t always possible. A note about weather conditions at the time of the test and approximate elevation of the test site above sea level should be included. We hope that this will allow others to help contribute to our published data, while still maintaining confidence in the *value* of that data. Please, if you are interested in conducting your own tests, contact us in advance just so we can go over any questions. About 40 years ago, when I was an idiot teenager (yeah, I know — redundant, particularly in my case), we got this ’48 Willys Jeep. Since the engine was shot, we dropped an Olds V-6 in it. This was, essentially, like strapping a rocket to a skateboard. And it was too much power for idiot teenage me to handle. Twice I snapped the driveshaft on the thing, just dumping the clutch too damned quickly. Twice. My uncle (who I lived with) was certain that I had been racing or something similar. The truth was, I didn’t even have that much of an excuse; I had simply goosed the engine too much and popped it into gear too fast. The original driveshaft just couldn’t handle that much of a power spike. This is kinda what happens to your poor .45 ACP firearm when you decide to run some .45 Super through it. With the Jeep, we wound up putting a more robust driveshaft in it. And I learned that if I wanted to keep driving it, I needed to be less of an idiot. This analogy holds to how you should approach handling .45 Super power out of your .45 ACP gun. Chances are, very occasional use of these much more powerful loads won’t cause any problem in a quality, modern-made firearm. But if you’re smart, you’ll either greatly limit how many times you subject your gun (and your body) to that amount of power, or you will take steps to help manage it better and extend the life of your gun. Typical ‘standard’ (non +P) .45 ACP loads tend to have a maximum pressure of between say 15,000 PSI and about 18,000 PSI. When you get past that, you get into ‘over-pressure’, or +P territory, up to about 23,000 PSI. This is the range most common modern firearms are built to handle safely. But .45 Super generates more chamber pressure than that. How much more? Well, it’s a bit difficult to say, since there is a surprising dearth of data readily available. Neither my 49th Edition of Lyman’s Reloading Handbook nor my 13th Edition of Cartridges of the World have data for the .45 Super. Real Guns has some reloading formulas for .45 Super which give results consistent with our tests, but there are no pressure specs listed. Hodgdon Reloading has some pressure specs (in C.U.P. ), but all their listed results for .45 Super are well below what our tests results were. Wikipedia lists .45 Super as having a maximum pressure of 28,000 PSI, and given that .460 Rowland is usually considered to run 35,000 – 40,000 PSI, that is probably in the correct ballpark. I have written previously about converting a standard Glock 21 from .45 ACP over to .460 Rowland, and what is involved with that. Specifically, a new longer barrel with a fully-supported chamber which accommodates the longer case of the .460 Rowland, a 23 pound recoil spring, and a nice compensator to help tame the recoil. I also changed out the magazine springs, using an aftermarket product which increases the spring power by about 10%. This is because even with the other changes, the slide still moves much faster than with .45 ACP loads, and the increased mag spring power helps with reliability in feeding ammo. But even with all of that, shooting full-power .460 Rowland loads tends to cause damage to my magazines (as seen in the linked post). Do you need to do all that in order for your firearm to handle frequent use of .45 Super loads? Well, I think that if you want to use a .460 Rowland conversion kit, it *will* tame the amount of recoil more than enough, but I don’t think that it is necessary to go quite that far. I should note that I have now run several hundred .45 Super loads through my Glock 21, and the gun has operated flawlessly — WITHOUT any damage to the magazines. Rather, I think that the smart thing to do is to start off with going to a heavier recoil spring, perhaps swapping out a metal guide rod for a plastic one (if your gun comes with a plastic guide rod). Stronger magazine springs are probably still a good idea, to aid with reliable feeding. If suitable for your gun, add in a recoil buffer. These are the steps I have taken with my Glock 30S, and am planning for my Beretta Cx4 Storm. So far I have put a couple hundred .45 Super loads through the G30S with this configuration, and it has operated without a problem — again without any damage to the magazines. As I said in my previous blog post, I still think that the .460 Rowland is a hell of a cartridge. But I think that the .45 Super offers almost as many advantages to the average shooter, with less hassle. I would still recommend that anyone who intends on shooting more than the very occasional .45 Super loads out of their gun consider making some simple changes to handle the additional power and extend the life of their gun. Don’t be like the idiot teenage me; deal with the power intelligently. .45 Super data now published. At long last, we’ve now put up the page with the results of our .45 Super/.450 SMC tests earlier this year! We’ve also published the additional .45 ACP rounds tested at the same time, which doubles the amount of data for that cartridge available on our site. .45 Super and .450 SMC (Short Magnum Cartridge) are two relatively recent variations on the classic .45 ACP cartridge. They were designed to gain more power from the cartridge than it was originally designed to produce, using modern smokeless powder and more robust case specifications. And these rounds achieve this goal, producing about 100% greater muzzle energy for a given bullet weight over standard pressure .45 ACP rounds, and about a 50% increase over .45 ACP +P (over-pressure) rounds. One thing I notice right away is that in general, the energy curve for this cartridge is much more pronounced and consistent than the energy curve for .45 ACP loads (whether standard pressure or +P). In other words, this is a round which continues to see impressive gains in energy over a longer barrel length, rather than flattening out starting at 8 – 10″. That’s more like the behavior you see from a magnum revolver round. Even the .460 Rowland tends to not see much gain after about 10″ — with the result that while the .460 Rowland is clearly a superior round for shorter barrels over the .45 Super, most loadings of the .45 Super meet or exceed the energy of the .460 Rowland by the time you get to carbine-length barrels. And you don’t need to rechamber your gun to shoot it. Seeing this performance out of the Cx4 Storm actually prompted me to act on something I had just been thinking about: to go out and buy one of the remaining new Cx4 Storms out there (Beretta decided to discontinue the gun in that caliber earlier this year). In a future blog post I’ll talk about the alterations I am making to that gun, and that I have made to a Glock G30S, to handle the additional power of the .45 Super cartridge. For now, enjoy playing with the data. And please be sure to share it with others! Because while I have long been an advocate for the .460 Rowland — a cartridge I still like very much — I now think that the .45 Super is a better choice for most people. Further discussion of that next time. Does primer size make a difference? Following the success of our .45 Super/.450 SMC tests this summer, I sat down to work up some reloads which would mimic the factory ammo we had tested. Since both of these cartridges are fairly unknown, there isn’t a whole lot of good information out there to draw upon. But there is some, at least for the .45 Super, and late last year/earlier this year I had worked up some preliminary loads, starting with .45 ACP +P (overpressure) published load data. But that was done using .460 Rowland cases and shot through my converted Glock G21, which I knew could handle the extra power. When reloading, it pays to be careful and conservative. 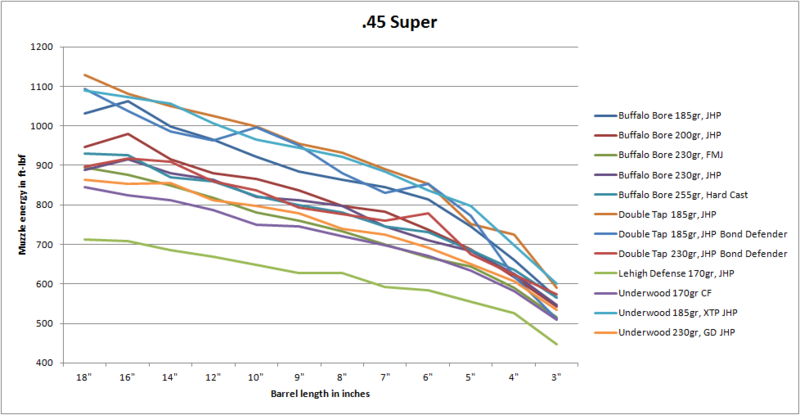 After I had seen the results from the extensive .45 Super/.450 SMC tests (some of which has already been published), I had a pretty good idea of where the power band for these loads was, and how different guns could handle it. Since I had previously worked up loads for .460 Rowland as well as done a lot of .45 ACP reloading over the years, I figured that I could come up with some pretty reasonable load levels to match what we had seen in the factory ammo. So I sat down, looked through all my results and what was available elsewhere, and came up with loads* for three different bullet weights I had on hand: 185gr XTP, and 200gr & 230gr FP. I chose to use Longshot powder, which I have used successfully for both .45 ACP and .460 Rowland loads. (This is not an endorsement of any of these products, and I have not been compensated from these manufacturers in any way. This is just stuff I have on hand and know has worked previously.) 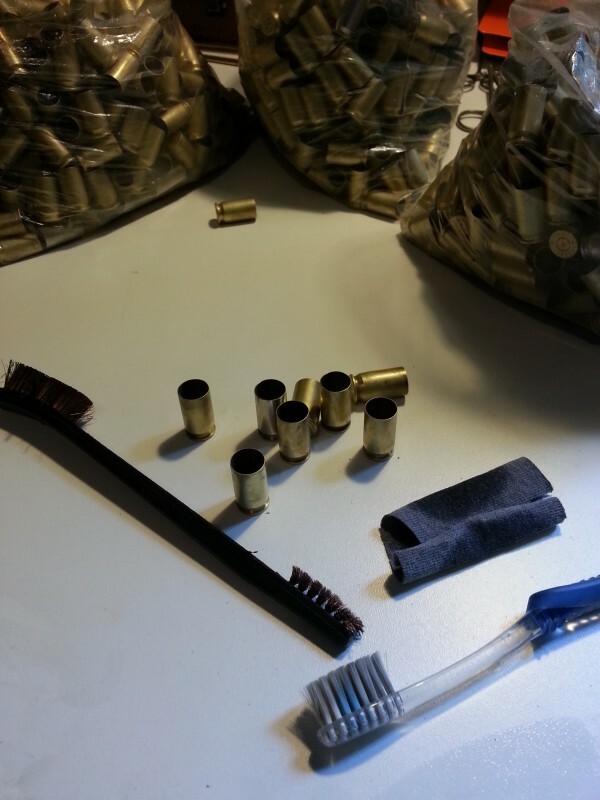 I loaded 50 rounds each in .45 Super cases, using standard Large Pistol Primers. But as I was doing so, I also realized that I had a bunch of .450 SMC cases left from the tests. And I figured that it might be an interesting experiment to load those cases to the exact same specs, other than the difference in primer size. To give the cartridge the benefit of better ignition, I used Small Magnum Pistol primers. Again, I loaded 50 rounds of each bullet weight. Again, other than the difference in primers, the reloads I worked up were identical. This was an informal test, using only one chronograph and under less rigorous conditions than the formal BBTI tests. It was just me shooting a string of five shots, keeping mental track of what the numbers were for each, and then writing down a ballpark figure which seemed to best represent the overall performance. Also, I wasn’t using the BBTI light-frame which gives us more consistent chrono results. I was using my personal firearms, two of which (the Cx4 and Glock G30S) were brand new — this was their very first trip to the range. Yeah, I got them after seeing how similar guns performed in the .45 Super/.450 SMC tests earlier. Interesting, eh? What seems to be happening is that full ignition of the powder takes longer with the .450 SMC loads. That would explain why there’s more of a discrepancy with the lighter bullets and shorter barrels, so the bullet clears the barrel faster — some of the powder hasn’t yet ignited with the Small Magnum Primer. But with the heavier bullets and longer barrel of the Cx4, there more time for more of the powder to ignite, reducing or eliminating the difference in performance. That’s my take on it. If you have another one, please comment. Also, I want to note just how well I managed to emulate the performance of the factory ammo. Compare the numbers above with what I have already published for the Glock 21 and Cx4 used in the tests earlier. And it isn’t published yet, but the G30S numbers are also right on-the-money for how the G36 used in the tests earlier performed (the two guns have the same barrel length). In all instances, my reloads* performed within 10-15 fps of the factory loads. *So, what exactly were those loads specs? OK, here’s the data, but provided with the understanding that you should WORK UP YOUR OWN LOADS starting below these amounts, and accepting that you do so on your own responsibility. Also note that any changes in bullet weight, bullet brand, or powder type may/will alter the results you can expect. AGAIN: you use this data on your own responsibility. Be safe. All bullet weights had a 1.250″ O.A.L. All were given a slight taper crimp. 185gr XTP rounds had 11.0gr of Longshot powder. 200gr FP rounds had 10.5gr of Longshot powder. 230gr FP rounds had 10.0gr of Longshot powder. Do you want good data, or useable data? Thanks for the site! You do not post the altitude and temperature of your results (unless I missed that). Can you let us know what your reference points are? Also, what effect would altitude and temperature variation have on your results? Well, it’s been a while since anyone asked about that … thanks! We did discuss this early on, and decided pretty quickly that while both of those would indeed have an effect (as would the changes in barometric pressure), that it would be so small as to not matter for the degree of accuracy of our testing equipment and the limited number of rounds tested. If you were trying to get really good data, everything would have to be much more rigorous and controlled … and we would never ever have gotten the data that we did. So as I remind people: consider the results to be *indicative*, not definitive. In other words, don’t try to read too much into variances of a few feet-per-second, or convince yourself that such minor differences really matter. Hope that helps to give a little perspective. Oh, and I can answer one of your questions: almost all the testing was done at an elevation of approximately 744′ above sea level, according to commercial GPS systems. I think that’s pretty clear, but I want to emphasize one part of it: that if we had set out to provide really rigorous and statistically-significant data, the chances are that we would never have even gotten past the first test sequence. And that means there would be NO BBTI. As it is, we have tested something in excess of 25,000 rounds over the last 7 years. At a personal cost of more than $50,000. And that doesn’t begin to include the amount of labor which has gone into the project. To get really solid data which was statistically significant, we probably would have needed to do at LEAST three or four times as many rounds fired. With three or four times the amount of time testing. And crunching the data. And cost out of pocket. Which would have meant that we probably would never have gotten through a single test sequence. So it’s a matter of perspective. Do you want some data which is reasonably solid, and gives a pretty good idea of what is going on with different cartridges over different barrel lengths? Or do you want very accurate, high rigorous data which would never have been produced? PS: We haven’t forgotten about the .45 Super/.450 SMC tests — it’s just been a busy summer. Look for it soon. Some “Super” performance out of a Cx4 Storm. 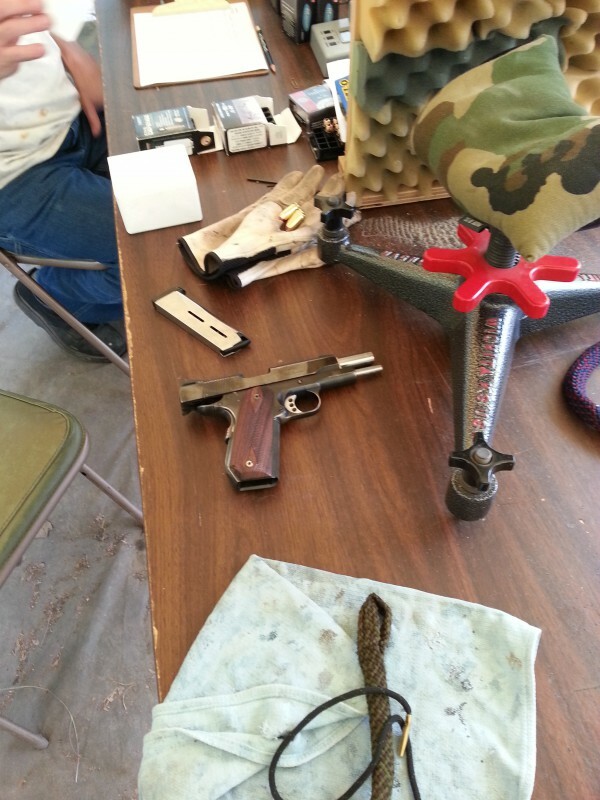 This is the third in a series of informal blog posts about the .45 ACP/Super/.450 SMC testing sequence we conducted over the Memorial Day weekend. You can find the previous posts here and here. I want to re-iterate that the Cx4 was completely stock, with no modifications or additions whatsoever for these tests. As I said with the previous posts about these tests, it’ll be a while before we have all the data crunched and the website updated, but I thought I would share some preliminary thoughts and information through a series of informal posts. Quick note about the data below: All the ammo used, with the exception of the four * items, were part of our overall test sequence and had three shots made over the Oehler chronograph (which is a double-unit, and automatically records and then averages the two readings), representing a total of 6 data points. I’m just giving the overall averages here; the full data will be available on the website later. The four * ammunition types only include two shots/four data points through the Cx4. That’s because we only had one box of each of this ammo, and were wanting to get data which would be of the greatest use to the largest number of people. Something in particular I want to note: that in comparison to .45 ACP loads (whether standard pressure or +P), a number of the .45 Super/.450 SMC loads gain significantly more from the longer barrel. Compare these numbers to the previous posts of handguns, and you can see what I mean. You typically only gain about 10 – 15% in terms of velocity from the .45 ACP loads in going to a carbine — and this is very much in keeping with our previous testing of that cartridge. But you see upwards of a 30% gain in velocity out of some of the .45 Super/.450 SMC loads … and that translates to a 50% increase in muzzle energy! A heavy, large projectile hitting with 900 – 1,000 foot-pounds of energy is nothing to sneeze at. Particularly when it comes with very little felt recoil out of this little carbine. That means you can get quick and accurate follow-up shots, which is always an advantage when hunting or using a gun for self/home defense. As noted previously, we noticed no unusual wear on the Cx4 Storm, though a steady diet of such ammo could increase wear on the gun over time. And the Beretta didn’t have any problems whatsoever feeding, shooting, or ejecting any of the rounds. Where we had experienced some problems with the same ammo out of some of the handguns, there wasn’t a hiccup with the Cx4 Storm. Look for more results, images, and thoughts in the days to come. This is the second in a series of informal blog posts about the .45 ACP/Super/.450 SMC testing sequence we conducted over the Memorial Day weekend. You can find the previous post here. As I said with the other two posts about these tests, it’ll be a while before we have all the data crunched and the website updated, but I thought I would share some preliminary thoughts and information through a series of informal posts. Quick note about the data below: All the ammo used, with the exception of the four * items, were part of our overall test sequence and had three shots made over the Oehler chronograph (which is a double-unit, and automatically records and then averages the two readings), representing a total of 6 data points. I’m just giving the overall averages here; the full data will be available on the website later. The four * ammunition types only include two shots/four data points through the Ed Brown Kobra Carry, since it is a typical length for a self-defense gun. That’s because we only had one box of each of this ammo, and were wanting to get data which would be of the greatest use to the largest number of people. As with the other guns I’ve posted about, the general trends are pretty clear with the power rising as you go from standard pressure to +P to Super/.450 SMC, and topping out at about 750 foot-pounds of energy in a couple of loads. And it is interesting to note that the 185gr loads seem to be the “sweet spot” in terms of power across the board. Of course, pure power is just one component for what makes a good ammunition choice. Bullet design & penetration is extremely important when considering a self-defense load. Shootability in your gun is also critical — because if you can’t recover quickly from shot to shot, then you may limit your ability in a stressful situation. Likewise, if the ammo doesn’t function reliably, or damages your gun, that is also a huge factor. Most of the ammo we tested functioned very well in both 1911 platforms. Interestingly, while we had experienced FTFs (failure-to-fire) with a number of the different Double-Tap rounds in both the Bobergs and the Glocks, we didn’t experience any such problems with either 1911. The larger platform of the Wilson Combat Hunter handled the recoil very well, even from the hottest loads. Recoil was a little more noticeable with the Ed Brown, but only by a slight amount. As I noted with the Glock 21 converted for the .460 Rowland, I was impressed that The Wilson Combat Hunter didn’t have any problems cycling even the lightest loads reliably. Another note: we were unable to detect any damage or unusual wear to either gun, though it is possible a steady diet of loads of that power could cause some over the long term. Lastly, I ran some .460 Rowland Buffalo Bore 230gr JHP cartridges through the Wilson Combat Hunter, since we had only had one type of ammo for that gun when we did the .460 Rowland tests. That had been Cor-Bon Hunter 230gr JHP. The Cor-Bon tested at 1213 fps / 751 ft-lbs, and the Buffalo Bore tested at 1349 fps / 929 ft-lbs of energy. This is the first in a series of informal blog posts about the .45 ACP/Super/.450 SMC testing sequence we conducted over the Memorial Day weekend. It’ll be a while before we have all the data crunched and the website updated, but I thought I would share some preliminary thoughts and information through a series of informal posts. In this post, we’ll see how two different versions of a Gen 4 Glock 21 performed with the ammo. The first version was with the Glock in the standard .45 ACP configuration, the second was with my .460 Rowland conversion kit in place. The standard configuration has a 4.61″ octagonal polygonal rifling, while the conversion barrel is 5.2″ overall with conventional rifling, threaded, and with a compensator. The .460 conversion also has a heavier recoil spring. Quick note about the data below: All the ammo used, with the exception of the four * items, were part of our overall test sequence and had three shots made over the Oehler chronograph (which is a double-unit, and automatically records and then averages the two readings), representing a total of 6 data points. I’m just giving the overall averages here; the full data will be available on the website later. The four * ammunition types only include two shots/four data points through the standard Glock 21 configuration — we only had one box of each of this ammo, and were wanting to get data from a range of guns. The general trends are pretty clear with the power rising as you go from standard pressure to +P to Super/.450 SMC, and topping out at about 750 foot-pounds of energy in a couple of loads. And it is interesting to note that the 185gr loads seem to be the “sweet spot” in terms of power across the board. 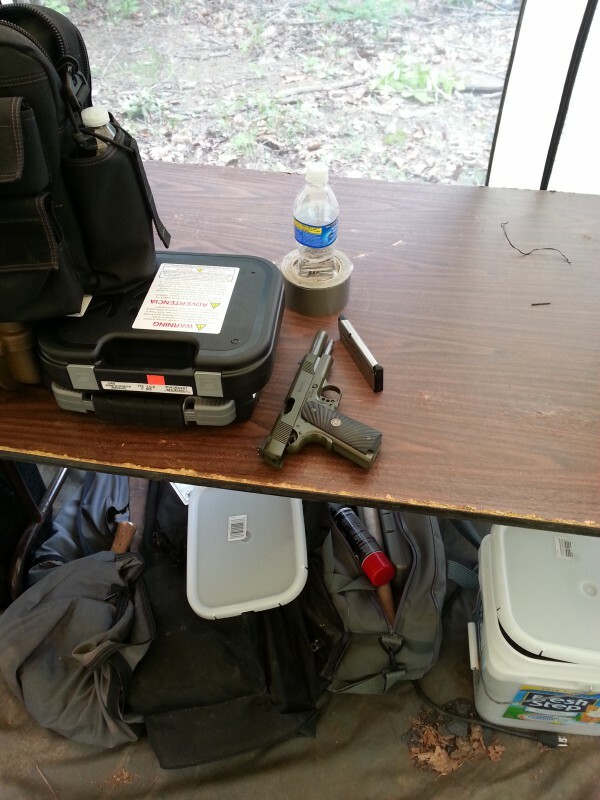 Most of the ammo we tested functioned very well in the Glock in either configuration. This isn’t surprising to anyone who has much familiarity with Glocks which typically will handle just about any ammo under all conditions. We did experience FTFs (failure-to-fire) with a number of the different Double-Tap rounds. Those seemed to have been due to light strikes on the primer, which could have been due to improper primer seating, ‘hard’ primers, or some other factor. The larger platform of the Glock 21 handled the recoil very well, even from the hottest loads. I was impressed that even with the .460 Rowland conversion in place, with the additional weight of the compensator and the heavy recoil spring, the Glock didn’t have any problems cycling even the lightest loads reliably. One other note: as discussed in my blog post about the .460 Rowland conversion, full-power .460 Rowland loads tend to cause damage to the magazines. As far as we could tell, the same isn’t true of the full-power .45 Super/.450 SMC loads. Just one magazine (a new one) was used for all these tests, and there was no detectable damage. Nor was there any other damage detected to the gun otherwise, though it is possible a steady diet of loads of that power could cause some over the long term. In addition to the first data for both the .45 Super and .450 SMC cartridges, this will also almost double the number of .45 ACP loads we’ve tested. We’re looking forward to it! …whether back over 2014, or forward into 2015, things are pretty good vis-a-vis BBTI. Yeah, 2014 was pretty good. We didn’t do any formal testing, though I did some informal testing and a fair number of reviews of new guns or guns which were just new to me. Having the chance to do those now and again is enjoyable, without having the same deadline pressures I had when I was doing regular columns and reviews for Guns.com. The numbers also look pretty good for 2014. This blog went from about 12,000 visits in 2013 to 22,000 last year – nearly double. And the BBTI site itself jumped from 243,230 visitors in 2013 to 318,304 visitors in 2014 — an increase of about a third. Visits have also continued to climb pretty steadily from day-to-day, with typically about 1,250 or so daily by the end of the year. Given that we didn’t do any new testing, that’s pretty impressive. How about the year to come, then? Well, we’re planning on doing one largish series of tests, to cover .45 Super, .450 SMC, and a number of additional .45 ACP loadings. We haven’t yet set a date for this sequence, but I will post a note about it here and on our Facebook page once plans solidify. And behind the scenes, improvements continue at the BBTI website. We recently upgraded our hosting set-up, to shift over to more modern software technology. We’ve started discussing how we can do better presentations of our graphs and spreadsheets. I would still very much like to work with someone to develop a mobile app — if you have the necessary skill set to do that, please drop me a note. And whenever someone finds a glitch in our data or how the site renders for them, we try and make the corrections. None of this is very obvious, but it is all a lot of work, and I’d like to once again thank our web guru (and my lovely wife) at Coeurbois Graphic Design for her efforts. Lastly, thanks to all who use the site regularly, who cite us in online discussions, who help to spread the word. And especially, I would like to thank all who have donated to BBTI in the last year — your tangible contributions make a difference, and help to offset our ongoing costs.